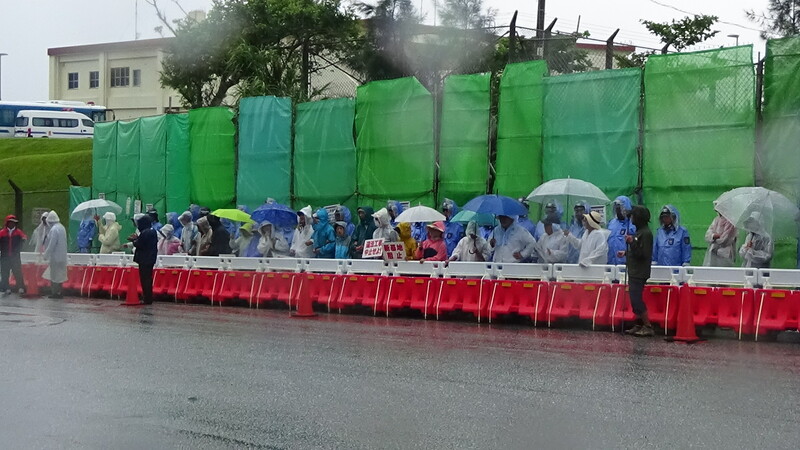 In a cold rain, from 7:30am, approximately 100 people gathered around the Gate and called out aloud in protest. Three times a day, the total of 300 truckloads of landfill material including crushed stone were delivered to the military base. In a chilly rain, only 20 people gathered. A drastic decrease from the yesterday’s number of over 100 participants. We stirred up our spirits and called out aloud to the trucks. A care package of hot coffee was a welcome. The trucks started making deliveries from 7:30am, but finished by noon. The reasons unknown. At 11:30am, a carrier boat with a full load left the Pier to Henoko. 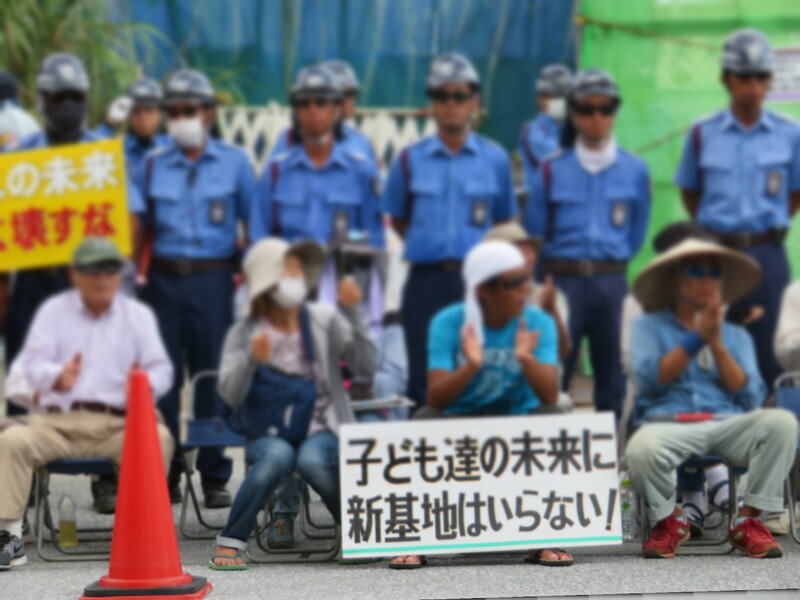 “Henoko Referendum Committee, Yes or No to the construction of the new military base” representative, Jinshiro Motoyama, launched a hunger strike in front of Ginowan City Hall three days ago. 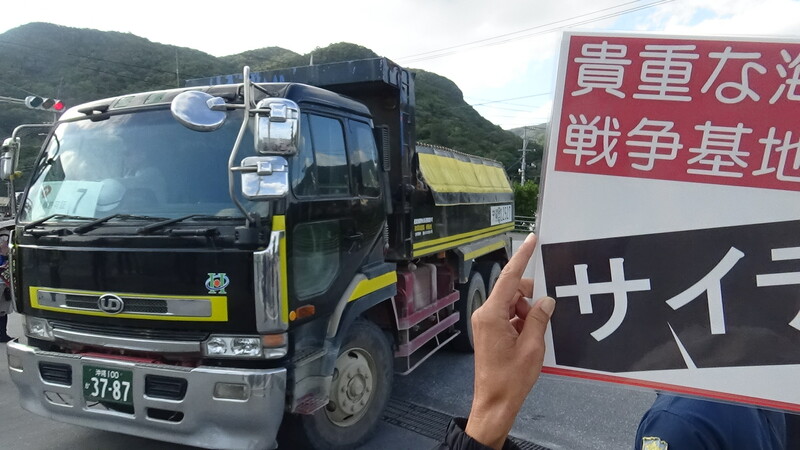 The petition for the referendum collected four times more signatures than the required number to directly petition to the Prefectural Assembly and was accepted at the Prefectural Assembly. However, there are 5 municipal assemblies that refuse executing the referendum. Their refusal takes away the voters’ right and violates the national constitution. Many people visited him to show their support. 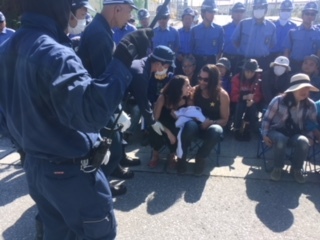 Mr. Motoyama stays in a tent and continues the hunger strike. Previous post Jan 16: “You are late to come!”, Mr.Yamashiro scolded the Diet members.